The Palestinians have a condition for the US to be accepted by them as a mediator in the conflict with Israel: bias in favor of the Palestinians. This is the Palestinian state of mind: If you are not with us, you are against us. The Palestinian leadership does not wish to talk about improving the Palestinian economy because Palestinians do not perceive themselves as engaged in an economic conflict with Israel: they perceive themselves as engaged in an existential, struggle-to-the-death conflict with Israel. In their view, for Palestinians to thrive, the State of Israel must go. Notably, the Palestinians reject the idea of Israel making peace with its Arab neighbors. They fear that such peace would come at the expense of them achieving political supremacy over Israel. 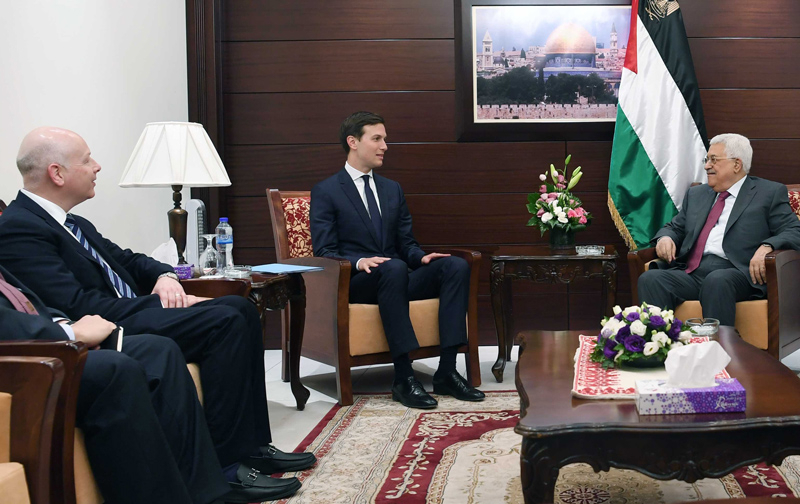 US President Donald Trump's envoys, Jason Greenblatt and Jared Kushner, are planning to return to the Middle East soon to discuss ways of reviving the stalled "peace process" between Israel and the Palestinians. Greenblatt tweeted last week that he was looking forward to returning to the Middle East "as we pursue peace." He added that Trump was "optimistic," but did not elaborate. Pursuing peace sounds wonderful. Less wonderful, however, are the facts on the ground of "pursuing peace" with the Palestinians. Not surprisingly, the Palestinians have returned to their old habit of accusing the US of being "biased" in favor of Israel. As the US envoys prepare to head to the Middle East, Palestinians are saying that they have lost confidence in the Trump administration, as they have done with all previous administrations. For the Palestinians, a US administration that openly supports the State of Israel cannot play the role of an honest broker in the Israeli-Palestinian conflict. For the Palestinians, US commitment to Israel's security and well-being disqualifies Washington as a mediator because it means that the Americans are "biased" in favor of Israel. In the Palestinian logic, the US administration must endorse the Palestinian narrative and comply with all their demands if it wishes to broker "peace" with Israel. The Palestinians do indeed want the US to be involved – as an axeman for their execution of Israel. The Palestinians are prepared to cooperate with any US administration, on one condition only: that it forces Israel to withdraw fully to the 1949 armistice lines and allow the incompetent and discredited Mahmoud Abbas to establish a corrupt, undemocratic and failed state, one that would set its predatory sights on the now-much-harder-to-defend State of Israel. Until recently, Abbas and his Palestinian Authority (PA) in the West Bank believed that the new president would swallow their fabrications and perhaps collude with them to bring Israel down. At one stage, Abbas even instructed his aides and spokesmen to avoid making any criticism against Trump or his administration, toward just this goal. However, the Palestinian tone has changed in recent weeks. Palestinian officials and factions and political commentators are no longer concealing their distrust of -- and disdain for -- the Trump administration. The "honeymoon" between the Palestinians and the Trump administration is over. Palestinians are waking up to the fact that the Trump administration is not planning to act as a puppet in their expansionist play. They are starting to see that the US has no intention of strong-arming Israel into making territorial concessions that would compromise its security. For the Palestinians, this is sufficient evidence that the Trump administration is not to be trusted. The Palestinians are not interested in the US acting as a mediator in the conflict with Israel; rather, they are interested in the Americans, and the rest of the world, imposing a solution upon Israel that threatens its security and strategic and national interests. In a reprise of a very old story, the Palestinians are prepared to return to table with Israel only if the US guarantees that the "negotiations" will involve compelling Israel to comply with all their demands. In light of the Palestinian disappointment with the Trump administration, what kind of reception are the Palestinians planning for Trump's envoys? Here is one sign of what awaits Greenblatt and Kushner when they arrive in Ramallah for talks with Abbas and his lieutenants: mass demonstrations. After an emergency meeting in Ramallah on August 13, Palestinian factions called for organizing mass protests against the visit of Trump's envoys and US "bias" in favor of Israel. The call could not have been issued without the approval of Abbas and the Palestinian leadership in Ramallah. A statement issued by the "National and Islamic Factions," a coalition of various Palestinian groups, including Abbas's own ruling Fatah faction, accused the Trump administration of working toward pressuring the Palestinians to resume peace negotiations with Israel unconditionally. The statement also accused the Trump administration of "incitement" against the Palestinians and allowing Israel to "steal" Palestinian land. The statement went on to accuse the Trump administration of promoting the idea of "economic peace" by focusing solely on the need to improve the living conditions of the Palestinians. It also dismissed as a "mirage" the Trump administration's talk about a "regional peace" that would see Israel and some Arab countries sign peace treaties "behind the Palestinians' back. Such sentiments are echoed by Palestinian political analysts who are affiliated with Abbas and the Palestinian leadership in Ramallah. "It has become clear that the US viewpoint is biased in favor of Israel," remarked Palestinian political analyst Anwar Rajab in an article published in the Palestinian daily Al-Hayat Al-Jadeeda, which serves as a mouthpiece for the Palestinian Authority. "It has become clear that Trump's envoys only carry suggestions for improving the living conditions and economy of the Palestinians." Rajab also scoffed at the idea of a "regional peace" and dubbed it a lie, illusion and a miserable piece of merchandise. Once again, the Palestinians are broadcasting clearly that the Trump administration's renewed effort to revive the peace process with Israel is unacceptable and doomed to failure because the US is not prepared to force Israel first into retreat and then into defeat. Blinded by their hatred for Israel, the Palestinians have long sidelined both their economy and their future to achieve their real goal: to see Israel forced to its knees, and then removed from the face of the earth. I took part in the Suez campaign (1956) when in Gaza after liberating the "Palestinian Arabs" from the Egyptian "control"= slavery= [cause for every favour they needed from the Egyptian military they had to pay "baksheesh,] they considered the Israeli army as liberators and at every corner there was coffee for us and thanks for what we done for them. Then came their Egyptian born leader Arafat and his administration, in many respects was not, and today is not better [sometimes even worse] than the Nasser military. Let us also not forget why the Kuwaitis threw out the Palestinians "refugees" and the Saudis to date try to avoid employment of Palestinians; they prefer Filipinos. I along with millions of others around the world are sick and tired of listening to the bleating of the fictional 1960s invention the Palestinians. They are a modern day invention of Jew haters period. How embarrassing. The possibility of President Trump achieving peace between the Israelis and the "Palestinians" is about as rational as the US putting an astronaut on the sun. Not going to happen and the idea that somehow this time it will be different shows ego on steroids. It also displays an incredible ignorance of the regional history and the unalterable realties as they exist. Too much leftist influence in the WH. Mid-twentieth century C.E., "confidence game" players were called "con men." Enforcing Palestinian/Muslim policy that Jews and Israel are all the same, tossing wheelchair-bound, waist-down-paralyzed Jewish-American Leon Klinghoffer into the sea from the hijacked Italian cruiseliner Achille Lauro, "moderate" Muhammad Abbas who masterminded and directed it is as cold-blooded a murderer as the Adolf boys (Hitler and Eichmann). Note: Y. J. Draiman's comments are ALWAYS "spot-on!" As long as Hamas rules Gaza there will be no peace. What did the Palestinians do for the land of Israel? Nothing but raise olive trees, sheep and goats. It was the Jews that modernized the country but were forced to relinquish land back at Camp David. There has been no peace since and never will be as long as jihadists rule and will never recognize Israel's right to exist. Please take a moment to write or call your representative to vote for the Taylor-Force Act. Taylor Force was a US military veteran and hero in Iraq and Afghanistan who was knifed in the back and killed by some Palestinian scumbag. The Palestinians use U.S. funds to pay their terrorists to commit acts like this. It's high time we stopped sending them money. No more money for terrorists! Thank you. Question: Who wanted to marry the Palestinian bride in the first place? Palestinians fit the perfect role as the mistress...... Loved when needed, ignored when not! Sovereignty of Israel with no safety and security is hollow defense. The State of Israel must always keep in mind its own sovereign obligations and be careful not to risk its capacity to perform the vital task of defending itself, its people, and its interests. Israel must even under the most adverse conditions; it shall not and must not capitulate to world pressure whereby its citizen's safety and security is compromised. In the past due to reasons which I will not enumerate at this time, Israel's government has made and applied decisions that compromise the safety and security of the country and its people. I hope Israel has learned from its mistakes and will not repeat those mistakes and maybe even try to correct those mistakes which Israel is paying the price on a daily basis with daily terror and violence and it seems that there is no end in sight. Israel has faced over 23,980 terror attacks since September 2000, when a wave of terror started against Israeli citizen's right after Arafat was offered a second independent Arab/Palestinian state, not withstanding Jordan which is officially an Arab Palestinian State since 1946 on Jewish territory. To date Israel's concessions and appeasement to the Arabs has decreased the safety and security of Israel's population. Let us act as the government of our Jewish land in all the areas west of the Jordan River, It is time to change direction and not worry about world opinion. Do not wait for the world at large to condemn these terrorist attacks, they did not care in the past when Jewish blood was spilled and they do not care now. The security and safety of the people of Israel must be first and foremost above any other consideration. That is the duty and obligation of a responsible government. Deliberating at time of National crisis without a previous set plan borders on dereliction of duty, based on Israel's experience with terror, they should know better. Meanwhile, Israelis are being killed and injured on a daily basis throughout Israel, while terror attacks continue unabated, stone throwing and riots must be stopped at all costs, the people in Israel feel unsafe and the economy is suffering. Get your act together, act immediately and forcefully with no compromise and zero tolerance, now this is the only way, it has to be Israel's way or the highway. Any delay in implementation will increase terror and violence and escalate the death and injury of Jewish lives in Israel. Israel must face the bold facts. The Arabs do not want peace, they never did, they only want the destruction of Israel, Israel must act accordingly with no illusion and fantasy or false promises that the Arabs are partners for peace, it is perfectly clear that they are not and they proclaim it repeatedly. The Arabs educate and train their children to commit terror and violence, celebrate and glorify suicide bombers, Need I say anymore. Stop bickering among yourselves, unify it is essential for our survival, and face the enemy with vigor and determination and do not stop until the enemy is totally vanquished and peace and tranquility returns to Israel. "A Unified Israel Is a Strong Israel"
I agree with every word you have written with one important reservation. You write Israel should not "worry" about world opinion. Realistically Israel MUST take notice of "world opinion" which is not saying Israel should obey it...it shouldn't as you indicate. Israel's trade with other countries and the political support it does get from other countries make it important for Israel to pay attention to what others think and say. The great mistake Israel has made for a long time is that it has not effectively...and I emphasize EFFECTIVELY sought to mold world opinion..its hasbarah has often been woefully deficient...it's most eloquent prime ministers have not been forceful and blunt enough in addressing controversies to the outside world in precisely the terms you, Mr. Draiman, have written. Lastly at the end of your comment you write that Israelis should stop bickering amongst themselves. Oh, yes indeed. But Israel is saddled with an utterly dysfunctional political system and until they make up their minds to junk it and substitute a far more rational and effective system they won't and can't stop bickering. I'm not an Israeli; it's their country. But the constant maneuvering of a multiplicity of political parties and their rapacious leaders and the constant creation and fragility of governing coalition is a recipe for internal fratricide. However your comments are absolutely on target and the Israelis should start following your good advice. Those really seeking peace have to be realistic, consider facts on the ground and QUIT PLAYING VICTIMS. Three conflicts HAVE to end. The Israeli-Palestinian, the Sunni-Shiite and the American-Russian one. The first of them is more ripe to solve if the fueding parties acquire the necessary courage, wisdom and summon their determination to proceed. Blaming others for our failures will not have the same powers as in the past. The world has grown weary of complaining or screaming and have many other issues to attend to. "The Honeymoon with the US is Over" It should have been over the moment the first Jew was blown up! The American envoys should not go to Ramallah. Negotiations, if conducted preferably, should be in Israel (Jerusalem) given the threat of organised protests. Also the Americans should make it plain they are not going to play the Palestinian's games and make it clear that if they insist on doing so they can stew for another decade or more. It is time to take a tough line with the corrupt and undemocratic Palestinian Authority. But for the risk that Hamas would possibly win a presidential election the Americans should insist on democratic change. Abbas is a real turd and he ought to be treated with the apparent disdain he deserves. He needs to be squeezed for his incitement to violence against Jews. There is another reason why there cannot be peace between Palestine and Israel, namely that the Muslim world would never allow it. You only have to look at the current situation between India and Pakistan, and the fight over Kashmir. That has now lasted for 70 years. The totally unwarranted splitting of India due to the whim of Mohammed Ali Jinnah who demanded the Muslims have their own state resulted in several million displaced persons and a million deaths. Very insightful. Who says Bacon cannot be kosher? To this day, American tax dollars are still bled from my pocket and given to the PA. More than half the money it receives appears to go for terrorist payments to the families and the actual terrorists as an incentive to inspire the murder of yet more Jews - and more Americans like me. Please, President Trump: pull the plug on THAT swamp! The first thing as there never was a country called Palestine why should there be negotiations. There is one solution that is the sovereign state of Israel. If the Palestinians thought that the current US admninistration was going to follow in the footsteps of the previous administration, they were simply not paying attention. They have an opportunity here but if they do not make the most of it, they will find themselves faced with an implacable foe. The Palestinians don't take any of that seriously. They are in it for the money and the long game. Their real interest is in delaying indefinitely any settlement at all. The longer they wait the more money they rake in from the UN et al and they can afford to wait. Israel should just recognize the Palestinian state and then once they start throwing rockets again it will be a state of war and Israel can then put an end to it. Great gutsy article Bassem. Anwar Rajat should not play chess. He'd make a lousy pawn. Palestine expects the west to roll over and play dead, then appease, appease, appease whining that political entities who compromise are 'displaying weakness'. Palestinians, tragically enough, behave like children and the weak kneed PLO treats them accordingly. How do I understand the Palestinian right to set up a US envoy for peace in order to achieve their peace. Already too much. Peace must be at the outset of the meeting, and this is a real opportunity for Palestine and Israel to do so at the meeting. Those mean old Palestinians got what they deserve. Israel has to exist as a nation according to the Bible. Palestine is a 20th century invention opposing the Divine purpose of salvation and the return of the Lord Jesus Christ. Clarification on the 1949 Armistice bears scrutiny. Does Abbas want to go back to Partition? Would he submit to the UN governing Jerusalem to protect the Holy Places from violence fomented by supremacists? Would it be governed by civil or sharia law? The armistice was enforced by the UN I don't believe there is anything substantive in Abbas demand for 1949 Armistice lines, it's just another obfuscation that puts the lives of all Israeli citizens at risk or under the thumb of another Islamic State's tyranny. This American is against them. Abbas is merely parroting Nasser who believing victory against Israel in 1967 would erase the shame of defeat in 1956 and correct the disaster of 1949. All this is is proof the Palestinian leadership has never negotiated for peace in good faith. They are not interested in peace and I doubt if the Armistice lines are all they want in the name of Allah. They will want a submissive Jewish entity if one at all, the sanctuary Israel is for Christians will be gone and the Right of Return will demanded and looting to redress the disparity and sense of failure that is the outcome of Islamic states and Marxist states as well. The basis of any negotiation should be that the West Bank is returned to Israel. After all, it was Jordan that annexed it in 1947 in violation of the UN agreement. which was that land to the west of the river was Arab (JOrdan) and that to the east was Jewish (Israel). 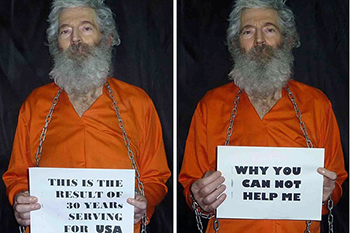 In addition all US / UN aid that supports terrorists in jail or killed should cease. Let the Arab states pick that load up, they can afford it. "From the river to the sea" is Israel, like it or not and it is not and never will be "Palestine" for the "Palestinians" a nation invented yesterday. Time for the Arab solution invented against the Jews they cleansed out from all Arab states. Time to repeat the cleansing, this time, cleanse out all of the PA. They will not have to live in tents like the Jews did arriving in Israel to save their lives leaving everything behind. Jewish homes left behind are waiting for you, nest of scorpions hatched for Islamic terror.